Our staff believes that informed patients are better equipped to make decisions regarding their health and well being. For your personal use, we have created an extensive patient library covering an array of educational topics. Browse through these diagnoses and treatments to learn more about topics of interest to you. Or, for a more comprehensive search of our entire Web site, enter your term(s) in the search bar provided. Crutch pad distance from armpits: The crutch pads (tops of crutches) should be 1½" to 2" (about two finger widths) below the armpits, with the shoulders relaxed. 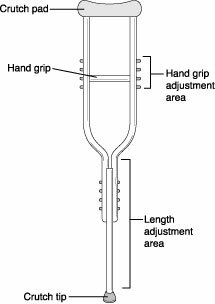 Handgrip: Place it so your elbow is slightly bent – enough so you can fully extend your elbow when you take a step. Crutch length (top to bottom): The total crutch length should equal the distance from your armpit to about 6" in front of a shoe. The tripod position is the position in which you stand when using crutches. It is also the position in which you begin walking. To get into the tripod position, place the crutch tips about 4" to 6" to the side and in front of each foot. Stand on your “good” foot (the one that is weight-bearing). If your foot and ankle surgeon has told you to avoid ALL weight-bearing, you will need sufficient upper body strength to support all your weight with just your arms and shoulders. 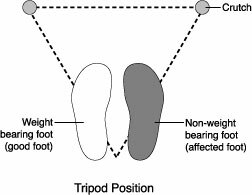 Begin in the tripod position, remembering to keep all your weight on your “good” (weight-bearing) foot. Advance both crutches and the affected foot/leg. Move the “good” weight-bearing foot/leg forward (beyond the crutches). Advance both crutches, and then the affected foot/leg. Repeat steps #3 and #4. Make sure the chair is stable and will not roll or slide. It must have arms and back support. Stand with the backs of your legs touching the front of the seat. Place both crutches in one hand, grasping them by the handgrips. Hold on to the crutches (on one side) and the chair arm (on the other side) for balance and stability while lowering yourself to a seated position, or raising yourself from the chair to stand up. The safest way to go up and down stairs is to use your seat, not your crutches. Seat yourself on a low step. If distance and reach allow, place the crutches at the top of the staircase. If this isn’t possible, place crutches as far up the stairs as you can, and then move them to the top as you progress up the stairs. In the seated position, reach behind you with both arms. Use your arms and weight-bearing foot/leg to lift yourself up one step. Seat yourself on the top step. Move your crutches downstairs by sliding them to the lowest possible point on the stairway. Then continue to move them down as you progress down the stairs. Use your arms and weight-bearing foot/leg to lift yourself down one step. Don’t look down. Look straight ahead as you normally do when you walk. Don’t use crutches if you feel dizzy or drowsy. Don’t walk on slippery surfaces. Avoid snowy, icy, or rainy conditions. Don’t put any weight on the affected foot if your doctor has so advised. Do make sure your crutches have rubber tips. Do wear well-fitting, low-heel shoes (or shoe). Do keep the crutch pads 11/2" to 2" below your armpits. Do call your foot and ankle surgeon if you have any questions or difficulties.